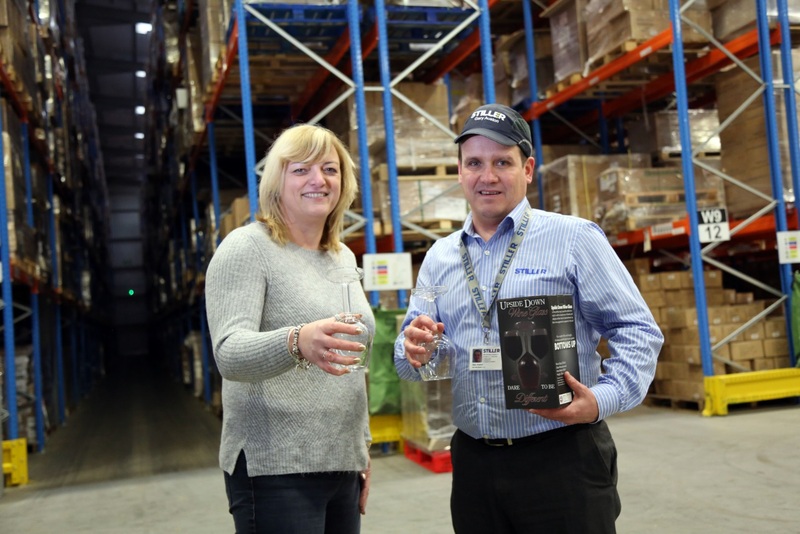 A thriving warehousing firm is stockholding thousands of items including upside down wine glasses as part of a new six-figure deal. Stiller Warehousing and Distribution on Aycliffe Business Park is holding 800 pallets of goods – weighing an enormous 400 tonnes – for Scarborough-based import and distribution firm AddCore. The new £150,000 contract involves storing AddCore goods in Stiller’s new state-of-the-art warehousing facility, which was completed in 2017, and distributing them around the UK. The deal has enabled the family-run firm to increase turnover, with 2017 sales at the end of December touching £15m – up from £11.9m in 2016. Founded in 2013, AddCore is a small innovative import and distribution company specialising in novelty gifts, glassware and novelty lighting, supplying both multi-channel retailers and high street businesses throughout the UK and Europe also with customers as far away as Dubai. Stiller managing director Matthew Stiller said: “AddCore is the perfect client for us because they’re utilising both sides of our business. “We’re both storing goods for AddCore as well as distributing them around the whole of the UK via the Palletline network, of which we’re members. “Our team began working with AddCore towards the end of last year to support them in the busy run-up to Christmas and in December we were shipping on average 10 pallets a day, involving five tonnes of goods, so it’s a good contract win for us. Stiller completed a new 40,000 sq ft, 10 meter tall warehouse at its premises in March 2017 costing £750,000, adding to the firm’s impressive facilities at its 22-acre site in Aycliffe. AddCore head of sales Pamela Pllu said: “We chose Stiller for our warehousing and distribution needs because they have the capabilities to help us grow our business. “The large modern warehousing facilities are the perfect solution to fulfil our customer service guarantee, offering a 24-hour dispatch of our products and our aim is to reach a better than service standard of same day dispatch. Stiller’s staff numbers climbed to 170 in 2017 and the firm expects to create more jobs with the creation of a new £2m distribution centre, set to be completed later this year and take staff numbers to 190. The 50,000 sq ft palletised distribution centre will be the largest of its type in the North East and will allow Stiller to load 30 vehicles at any one time. Stiller has invested almost £9m in equipment, people and facilities over the last three years, including warehousing facilities and a fleet of new vehicles.